I was looking for a carrot souffle recipe that would be perfect for the holidays and came across quite a few, I settled on this one and I was very happy I did. Original recipe comes from Emeril Lagasse, and if you can believe it, it had more butter and more brown sugar than it does, I took a few liberties with the recipe and it was just delicious. 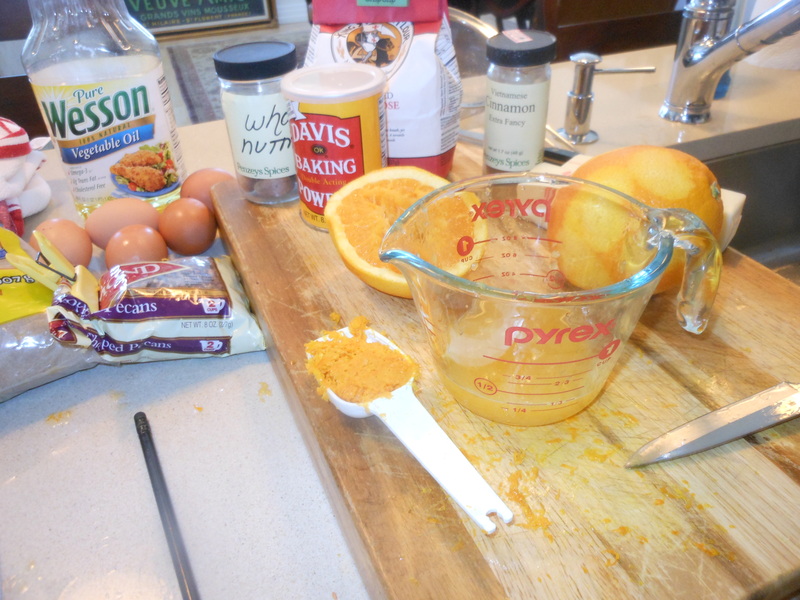 The orange flavor is very strong, so if you like you can cut that a bit but I love the fresh flavor of orange so I kept it at a full tablespoon. It is not difficult to make, just takes some time and a lot of ingredients. I peeled the carrots, and just cut them in thirds to boil, because they were getting thrown in the food processor anyway. You need a food processor for this, and a large one at that. I literally put all ingredients into it and gave it a few whirls. . It is a most perfect holiday dish, perfect for Christmas, Jewish New Year and Thanksgiving, really any time you are making dinner for a big group. If you’d like you can cut this recipe in 1/2 for a smaller gathering. I also didn’t use a 9 x 13 but used a deeper casserole dish, which was fine, you can use whatever pretty baking dish you like. I cooked it for 1/2 the time the day before and then just put in oven again day we were eating it for another 45 minutes or so. The deeper the dish , the longer it will take to fully cook through. It was light like a souffle should be and the topping is crunchy and sweet. This goes to any holiday meal, and really any time. Good news is carrots are always readily available no excuse not to eat them. Preheat the oven to 350 degrees. Spray a casserole pan ( up to 9 x 13 ) . 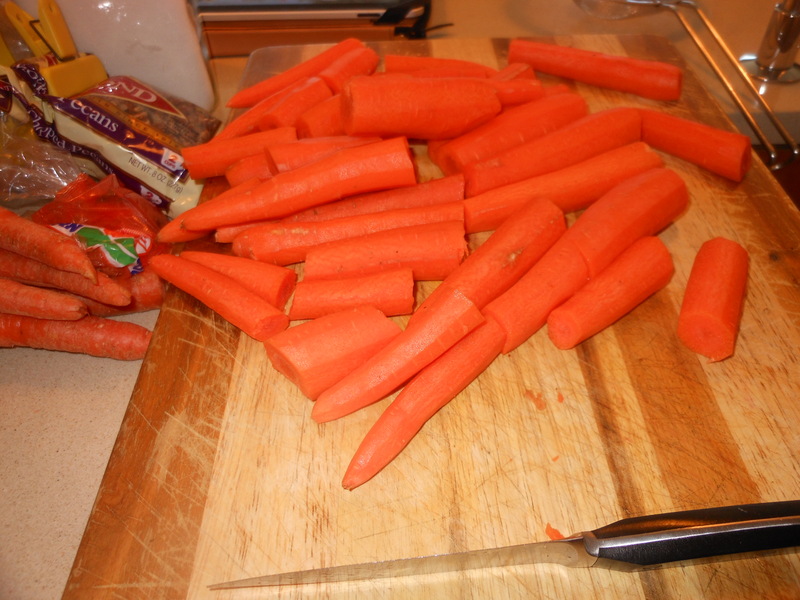 Bring a large pot of water to a boil, add the peeled cut up carrots, and cook until tender, app. 15 minutes and drain. Combine the carrots with the remaining ingredients in a food processor and process until smooth, scraping down the sides of the bowl as necessary. I was able to put all ingredients in a large processor, if not you will have to work in batches. Spoon the mixture into the prepared casserole dish. Combine the topping ingredients, brown sugar, pecans, flour and butter in a medium size bowl , stir to blend. 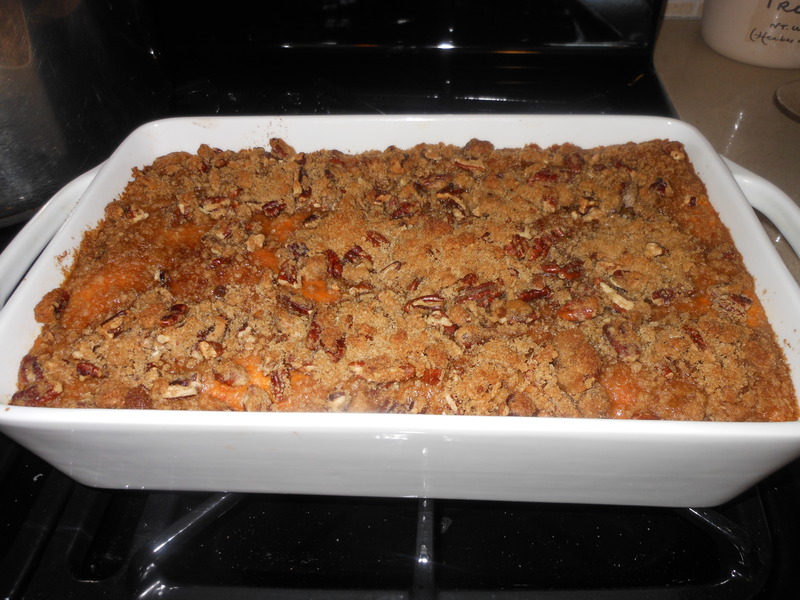 Scatter the mixture over the top of the casserole and bake until the topping is lightly browned, 55 minutes to 1 hour. I baked for 35 minutes the day I made it, and will re – heat it for another 45 minutes before serving. You’ll want it a little bubbly around edges. This entry was posted in Holiday/ Thanksgiving Recipes, meatless, vegetables and tagged Carrot Souffle, Carrot Souffle for Thanksgiving. Bookmark the permalink.